This is a state wide criminal background check. Korea now requires a national check. The easiest and fastest way to get your National FBI Criminal Background Check in order to come to Korea on an E2 visa is to visit a Live Scan Location. Because Live Scan technology offers digital fingerprints, the processing time for the background check may take less than the standard 3 month time frame. This process takes so long because your criminal history will be reported from all 50 states. There is also a mad rush of Americans currently living in Korea to get the national criminal background checks finished by the new deadline of Jan 1, 2011. After contacting the FBI, many teachers are simply keeping their fingers crossed because there is no way they are going to process that many requests before the 2011 deadline. Most of us believe that the Korean government will have to extend the deadline for us, because they did not provide ample time to get the new background check completed. So if you are currently in the U.S. be happy, because this process would be much harder if you were already in Korea and were forced to undergo this new change. This process takes up to 3 months, so be patient! If your already in Korea, visit FBI check for those already living in Korea. 1. First download the required documents for the FBI check from the FBI Website. A Check list so that you don't forget anything. 2. Go to a Live Scan center: Live Scan fingerprinting simply means that there is some office or service in your state which offers digital fingerprinting. This is the best form of fingerprinting because they are sent digitally to the government. This service also takes much better fingerprints than the traditional paper and ink method. Thus the digital prints are much more likely to be accepted than paper and ink prints. In California there is a huge list of live scan locations and hours on the Department of Justice's Website. Simply click on this link and find the nearest location to you. Attention: Make sure you check the FBI criminal background check box on the Live Scan center's application forms. 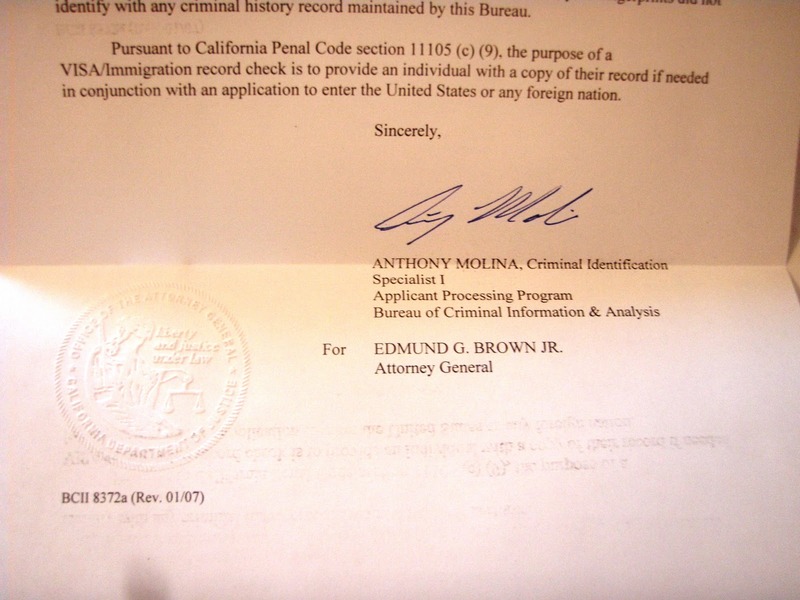 The DOJ box only checks your history in the state. The U.S. Department of State recommends that the documents be sent with the following cover letter: Office of Authenications cover letter. 5. Wait for the final apostilled documents to be mailed to your home. Once you have the notarized and apostilled national criminal background check documents you may mail them to your job in Korea. Your employer will take them to an immigration office to get processed along with your other documents. 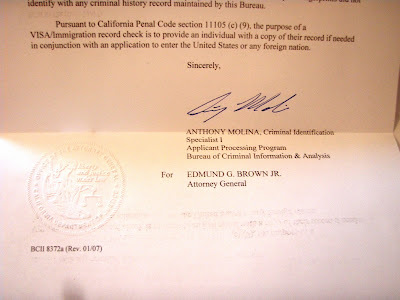 If you have any questions or comments about "Getting your FBI Criminal Background Check-for those currently living in the United States" please leave them in the comment box below or email them to goneseoulsearching@gmail.com. I was wondering which live scan form did you use for the fingerprint? Here is the link for the Live Scan form! Marie, the Live Scan form on the website is marked DOJ instead of FBI. Can I still use the same form and mark FBI instead of DOJ? Yes, you need to do this. But make sure that you confirm that the form is ok with your Live Scan operator. Good luck! I'm in Korea now. Do you know of any place that can take my fingerprints by Live Scan and send them to the FBI? Sorry about that. I don't know any places that send fingerprints by Live Scan in Korea. Usually you have to get them done the old fashioned way with ink and then mail them to the states. If you use Live Scan, how do you request it to have an official seal for the apostille? The process is still not clear to me. 1. If I get the live scan, do I still need to mail something to FBI? 2. Where do I write a note to FBI asking to use the official seal? In the live scan application form (8016VISA)? 3. Do I need to fill out the OCA number and employer information? Does the Korean government accept a fingerprint from a third party?